In honor of Mother's Day 2013, 12 generations of the Mothers of my Mother. Hey! The President of the United States is my Cousin! How do you like that! Both President Obama and candidate Mitt Romney are direct descendants of Edward the First, King of England. And so am I! I love finding new cousins! I don't know much about my Great Grandmother, other than the vital statistics. Her name was Myrtle Talbot, and she died in 1939, so none of her living grandchildren were old enough to know much about her, either. Her family has been a little challenging to find givin the various spellings of the names, Talbot. It has been recorded as "Talbert," "Tolbott," "Falbert," and even "Lalvat." Othello may have been called "Phil." His sister, Adelia, called Lelia, May, or Mae, and his brother, Leon or Leland. I do know that the research I have on her family makes me feel sad. 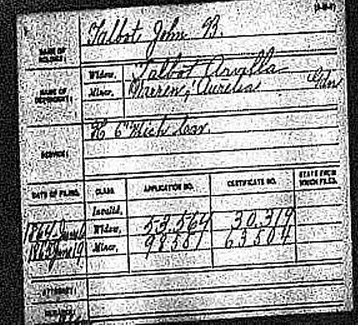 Her Father, Othello Talbot, was born at Assyria, Barry Co., MI on August 2, 1848 to John B Talbot (maybe called "Buren.") and Arvilla Andrews. He had a sister (Adelia Mae) who was a year older, and a brother (Leon) who was 3 years younger. In 1863, John enlisted as a Private in Co. H, 6th Michigan Cavalry. He died on February 29, 1864 from pleuro-pneumonia at the Third Division Hospital, Alexandra, Virginia. Othello was just 5 years old. 3 months later, she married a widower with 4 or 5 young children named Erastus Warren. I feel like it was probably a marriage of necessity, she needed support and he needed help with his children. Although she was later to recieve John's pension. For some reason, they are living separately in Bellevue, Eaton Mi. in 1870. Erastus Warren's household includes 2 young girls (aged 3 and 5) who are possibly Arvilla's children as well. When Othello was 14 years old, his mother died (April 18, 1873.) What do 3 young children with no parents do in 1873? Were they welcome in their step-fathers home? Did they go to live with one of their many aunts and uncles in Barry Co.? By 1880, Othello was married to my 2nd Great-Grandmother, Ella Odell. Ella was 17 years old and they lived with Ella's widowed mother on her farm. Myrtle was born on March 31, 1881 and she was their only child. Charlotte Tribune, October 23, 1889. 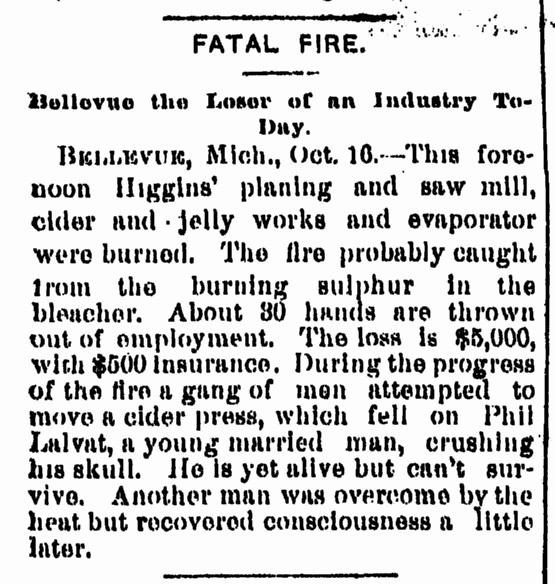 On Wednesday morning of last week our neighboring village of Bellevue suffered an irreparable loss in the death of one of her estimable citizens and in the burning of Higgins' saw and planing mill, cider and jelly works and fruit evaporator. The fire was discovered about 8 o'clock a.m. and the fire company was soon at work but the flames proved uncontrollable, and soon this institution, which was furnishing work to about 30 men, was reduced to ashes. One of the firemen, Mr. Othello Talbert, while helping to remove the cider press, was caught by falling timbers and received injuries to his skull that proved fatal a few hours after the accident. Mr.Talbert was an industrious young man of good habits. He leaves a wife and child. Several others were slightly injured. Probably no institution in Bellevue was doing more to give employment to the people than Higgin's mill. The loss will be felt by all. Mr. Higgins' loss was upwards of $4,000 and his insurance but $500. Being a public spirited, pushing, energetic man, it is more than likely that he will rebuild. Mr. Jas. Holden, who had an interest in the evaporator business, lost about $400. 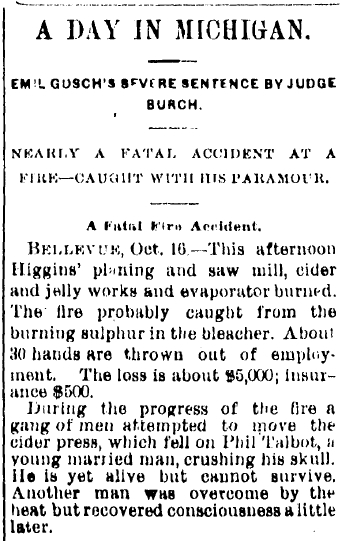 BELLEVUE, Oct. 16 - This afternoon Higgins' planing and saw mill, cider and jelly works and evaporator burned. The fire probably caught from the burning sulphur in the bleacher. About 30 hands are thrown out of employment. The loss is about $5000; insurance $500. During the progress of the fire a gang of men attempted to move the cider press, which fell on Phil Talbot, a young married man, crushing his skull. He is yet alive but cannot survive. Another man was overcome by the heat but recovered consciousness a little later. Bellevue the Loser of an Industry Today. 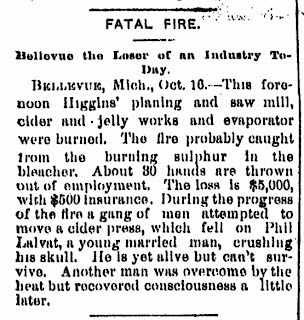 BELLEVUE, Mich., Oct. 16 -- This forenoon Higgins' planing and saw mill, cider and jelly works and evaporator were burned. The fire probably caught from the burning sulphur in the bleacher. About 30 hands are thrown out of employment. The loss is $5000, with $500 Insurance. During the progress of the fire a gang of men attempted to move a cider press, which fell on Phil Lalvat, a young married man, crushing his skull. He is yet alive but can't survive. Another man was overcome by the heat but recovered consciousness a little later. The accident left my Great-Grandmother fatherless at 6 years old.